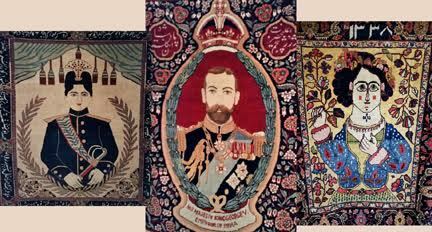 Pictorial carpets depict the Shahs of Persia, “beautiful women”, British Royalty, Sufis and an allegorical Tabriz Carpet with a panoply of Persian poets and literature. The carpets were woven in Persia; they range in age from 95 to 125 years. Judge Berry will discuss the history and composition of ten or twelve important examples with accompanying images. He further plans to bring four or five of these unique carpets for all to view and handle. He invites the Club’s members to bring their own pictorials for an enlivened show and tell. Judge Jeffrey Berry is a member of the Hajji Baba Club and serves on the Club’s Board of Directors. He is an avid collector of oriental carpets and bags. His collection consists mainly of Bidjar, Kurdish, Ferahan, Kerman, Josan and Sarouk carpets. Judge Berry recently retired from the Orange County Court and the NYS Supreme Court. He began his judicial career as a City Court Judge in Newburgh and thereafter presided as a County Court Judge and Acting Supreme Court Justice throughout New York State for the last 25 years. While elected in Orange County, the Judge’s expertise in handling serious, protracted, high profile cases caused him to be assigned throughout New York State from Essex County in the Adirondacks all the way to Kings County and numerous counties in between. Many of his trials were broadcast on television and their factual scenarios have become the inspiration for both film and TV plots. In 2013 Judge Berry was awarded the prestigious William J. Brennan Award as the Outstanding Jurist in New York by the State Criminal Defense Attorney’s Association. The Judge has received many other awards for community and legal service over his 32 year judicial career.